It is said that history is always written by the victors. Does partial victory count or does it lead to a partial rendering of history? Don't get me wrong. I am in no way trying to minimise the pain inflicted on black-Americans (or the enslaved anywhere in the world), but for me there was something about this film that wasn't quite right. It is a film about the struggle of black-Americans to gain equality in the 'Land of the Free". As the voice over towards the end tells us, we can all react to the horror of concentration camps in Germany - it's just that no-one calls them that in the south of the USA, but they've been there for more than 200 years and the effects of their presence continue to reverberate today. This is not simply an historical film, but a current one and this is a review of a movie and not a critique of the Civil Rights Movement. There is great acting (and casting) in this film. 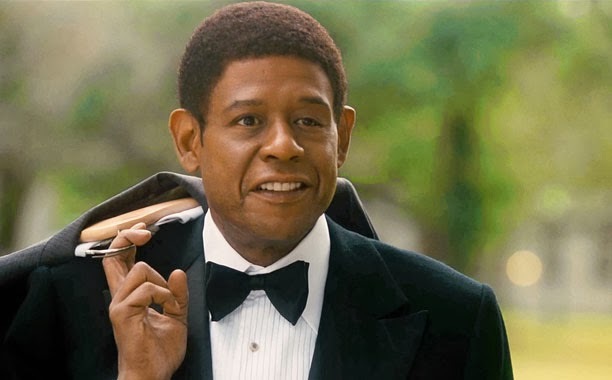 It's scope is immense as it charts the American civil rights movement through the eyes of a unique witness - a black Butler (Forest Whitaker) who serves successive Presidents in the White House. From Eisenhower to Reagan, The Butler was privy to the machinations and most intimate conversations at the heart of government. The film goes out of its way to depict Kennedy's young liberal idealism and hints at what might have been. It clearly has little affection for Johnson who is shown to be two-faced or Nixon whom it depicts as lacking moral scruples. (I wonder if this is reading things back into history after the fact?) The film almost completely skates over the Ford and Carter years and re-engages with Reagan whom it depicts, along with his wife, as genuine, benevolent and open people. From the outset of the film you know where the narrative arc is going. It starts in the 1920's with share-croppers in a cotton field in Georgia where the young Butler's mother is raped and father shot by their white 'owners' right through to the impossible, the election of Barak Obama to the White House. On the way the story charts the most significant events of the Civil Rights Movement including Malcolm X's Black Panthers and MLK. The sojourn through these contrasting styles of civil engagement is enacted through The Butler's eldest son Louis (David Oyelowo) as he determines direct action is the preferred route rather than the wait-and-see approach advocated by father. This sets up inevitable tensions leading to estrangement and reconciliation whilst the youngest son is sacrificed to the ideals of the Vietnam War. What starts out as an historical bio-pic turns into more of a fly-on-the-wall documentary as The Butler observes, but never intervenes, as successive Presidents wrestle with the Civil Rights problem in a way that tries not to alienate a fickle electorate. The generous use of original TV footage adds to the documentary feel rather than bringing the story the alive. If the story-telling might not be this film's strong suit, where this film does win is in the all-star cast that assemble to deliver many strong performances and cameos. Among them feature, Robin Williams, Vanessa Redgrave, Alan Rickman, John Cusack, Lenny Kravitz, Mariah Carey, Terrence Howard, Cuba Gooding Jr, Liev Schreiber, Jane Fonda and of course Oprah Winfrey as Gloria, The Butler's wife who delivers a very strong performance. I wouldn't be surprised to see the two leads Oscar nominated. For all it's short-comings, this is an important film as no other has sought to chart the Civil rights Movement in quite the same way. A Thief in the Night is cited in the film, but there are few other cultural reference points. IMDb has a list of films with a Civil Rights motif here. At 132 minutes it is half an hour too long. However, it is worth a watch. I'll give it 7.5/10.